October 20, 2017, 4:29 PM · When my daughter, Natalie, age 20, announced that she'd be studying abroad this fall at Maastricht University in the Netherlands, I wanted to learn all I could about this southern city along the Belgian border. Naturally, I turned to Google. "NO WAY!" I shrieked excitedly. "It's the hometown of André Rieu! And look, he lives in a 15th-century castle there!" "Uh, what?" said Natalie, not a violinist. "Who is this?" Honestly, I didn't have a quick explanation there, either. In fact, what was I so excited about? I'd certainly heard of the enormously popular Dutch violinist André Rieu, but being such a noodle-head classical music wonk, I'm probably not the direct target market for his show. It seems more like something out of Disney World than out of Disney Hall. But wait, I like Disney World. As soon as Natalie arrived in Maastricht, she saw what I meant. She started sending pictures to her Violinist.Mom: Andre Rieu in the student guidebook; a painting of Andre Rieu (as a peacock) in the café; and just last week - a train from Germany to the Netherlands labeled "Andre Rieu." Not only that, I discovered that Rieu was about to visit Los Angeles, where I live. This Sunday! 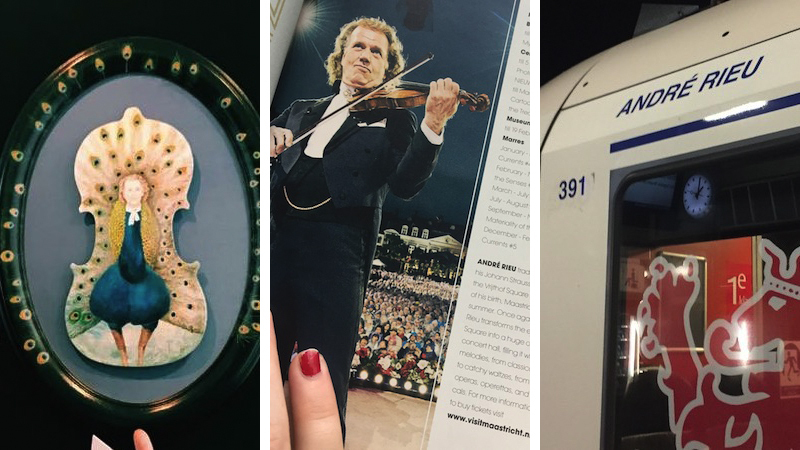 I decided that the stars were aligned: it was time to talk with André Rieu. 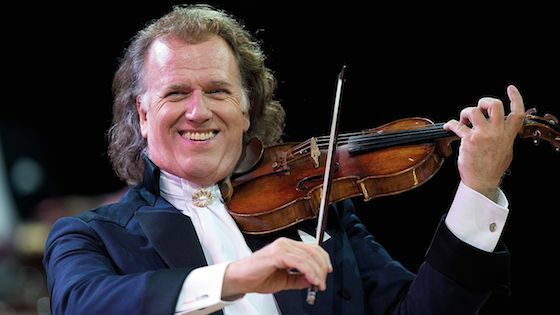 After all, Rieu is a violinist who has achieved an astonishing level of popularity - as well as wealth - performing and recording waltzes and related music. He travels the world with his Johann Strauss Orchestra, a 50-member ensemble which celebrated its 30th anniversary this year. At age 68, Rieu still performs some 100 concerts a year, to enormous audiences. For example, his Sunday performance in Los Angeles is completely sold out -- that's for the 7,100-seat Microsoft Theater. His website says he plays to 700,000 people a year, and the math would affirm that. The sets for his shows are elaborate; over the years they have included things such as ice rinks, fountains and ballroom floors. The ladies in the orchestra wear colorful ball gowns; orchestra members sit on golden chairs. There are dancers and other performers. Beyond his shows, he's sold more than 40 million record albums. About 2.4 million people "like" his Facebook page, and his YouTube videos have tens of millions of views. I got in touch through his publicist in the Netherlands, and we had a lovely email exchange, which you will see below. I'm hoping to go to his concert on Sunday - if I can get in! Laurie: I understand that you started playing the violin at age five -- what made you want to play? André: I grew up in a musical family: my father was a conductor for several symphony orchestras, and all my sisters and brothers used to play one or more instruments. My mother chose the violin as the most suitable for me - and she was right! Ever since I heard the romantic sound of that instrument, I fell in love with it and the love never stopped. It even grew and grew, and meanwhile, my violin and I are inseparable. André Rieu. Photo courtesy of the artist. Laurie: You have famously stated that Gold und Silber by Franz LeHar is the waltz that inspired your love for the waltz. Do you remember the first time you heard it or played it? What about it was so special to you? André: After my father performed the music announced on the program, he used to give an encore. Now and then, it was a waltz. My mother took all her children into her husbands' concerts and it was during one of them - while my father and the orchestra played the Beautiful Blue Danube or Gold und Silber - I noticed something extraordinary. The people in the audience, sitting absolutely still and quiet in their chairs the whole evening, suddenly began to move their bodies a little bit. I was amazed! Could that be caused by the music my father played? Apparently! A waltz is a special type of composition: when written well, it encaptures every emotion like love, understanding, harmony, melancholy... everything! Besides that, I think musical education is important and waltzing is very healthy. May be I sound like a doctor but I'm convinced that a waltz a day, will keep the doctor away! Laurie: I noticed that dance is an important part of your performances, and you dance as well. Was dance a part of your upbringing? What made you become interested in dance, and then in incorporating it in your shows? André: People of my age all took dance lessons. As a matter of fact, it was part of the education. I never had any dance lessons by the way, I was raised quite strictly. In the beginning of my career, when I had this Maastricht Salon Orchestra (consisting of only five members including myself), I was too shy to say anything. Therefore, the girl at the cello grabbed the microphone and told the audience: "Come on, let's dance a little bit." That's how it started. And let's be honest; it is rather difficult NOT to move when you hear all this beautiful dance music, don't you agree? Laurie: Can you tell me about your Stradivarius? I found two different dates for it (1667 and 1732) so I wondered, when was it made? Strads are so rare and hard to find, how did it come into your hands, and when? What made you decide that you must have it? Do you know its story, the people who played it before you? André: I used to play on the 1667 Stradivarius, an instrument the man made during his engagement with his future wife. The same love he felt for her, he somehow put in that instrument. You can hear that! Nowadays, it's the 1732 violin I play on. Although I don't know the previous owners, I am convinced that they all treated her (I mean the violin) with love and respect - that's also how one should treat a woman. The building process of the Stradivarius violins took years and years. When I do a little bit of math, I noticed that the trees for the wood of the Stradivarius instruments had to be put in the soil during Columbus' discovery of the New World. That makes it even more special for me to have the privilege to play on one of those violins. Laurie:: I'm a classically trained violinist, but in college I played in the Walt Disney World Orchestra in Florida. We wore costumes (not as pretty as yours though! ), smiled on stage, encouraged audience participation, played show tunes as well as classical, and generally more show-business. It really got me thinking about the nature of show business. I'm guessing you played and saw a lot of traditional orchestra concerts before you started your own. When did you start thinking about things like costumes? Why did this become important to you? André: This is an evolutional process. My Johann Strauss Orchestra celebrates its 30th anniversary this year: in the beginning, back in the 80s, we all (the men but also the women!) used to wear black clothes. That was very dull and gloomy. Slowly, I began to take care of the decoration of the stage. I had in my mind that "golden" chairs would have such a nicer appearance than the regular ones. Then the dresses of the ladies followed, as well as the complete decorum. My concerts should be a feast for every sense, not only the ears but also the eyes, for example. Laurie: What makes for a good show? What are the most important ingredients that make it work for the audience? What do you think are the ingredients that people most often leave out, when a show doesn't work? André: I don't know why some shows don't work; in my case, the magical word is authenticity. My orchestra members and I, we all believe in the magical power of music. We feel every note we play, and then we try to translate that feeling to the audience. We all love these wonderful compositions, and it may be be that that love and authenticity are things that sometimes are hard to find in other classical concerts. Laurie:I actually have a new connection to your hometown of Maastricht -- just last week I sent my daughter Natalie to the Netherlands -- she is 20 and will be an exchange student at Maastricht University for this entire academic year. It made me curious, what makes Maastricht such a magical place? Is there something about Maastricht that gave you these big dreams and Romantic ideas? That fed your ambition and your artistic sense? André: Maastricht is the oldest city in the Netherlands: I was born there and I will spend my whole life in this city. Remains of all ages can be found throughout the town. Some murals from a Roman temple, beautiful churches from the Middle Ages (complete with treasure rooms), ruins from the period Napoleon ruled Europe. Even the castle I live in dates back from 1534. Rumor says that the famous musketeer D'Artagnan had his last breakfast there! It's a historical fact that he died in front of the city walls, so it might be true! I hope your daughter will have a great time in Maastricht! Laurie: You are living proof that classical music can have wide appeal. Many people would love to replicate that popularity for other aspects of classical music -- do you think it is possible? How can we go about doing that? André: As long as you believe in what you are doing, then everything is possible. Don't see classical music as an art form meant for the elite only, it is composed for all of us to enjoy. Mozart was a pop star during his life; I am sure that, when he would live in the 21st century, posters of him would be the decoration of many girls' bedrooms. He would be on selfies daily and the 'likes' and tags on Facebook would be uncountable! BELOW: André Rieu's favorite waltz, Gold und Silber, played at one of his shows. October 21, 2017 at 12:00 PM · I have loved these performances since the first time I heard and viewed Andre Rieu and his beautiful orchestra on a Public Broadcasting Channel on television. Beautiful to hear and with all the energy and expression of Andre Rieu and all the musicians. It was in 2006 in Richmond, Texas and the lovely part is that I discovered these broadcasts while recovering from a serious cancer surgery. It was like a gift from God. October 21, 2017 at 01:34 PM · They play cheesy music, sure, but at least they play it well, and one can tell Andre loves what he's doing, so, totally fine by me...Also I've heard a live interview of him one day and he sounded genuine and humble. October 21, 2017 at 03:25 PM · Apart from violin concertos of the Romantic Period, I like light music the best performed by orchestras of Andre Rieu, Mantovani, James Last, 101 Strings, Paul Mauriate, just to name a few. Other too "serious" music, though of its own value,is less attractive to me. October 21, 2017 at 04:19 PM · Thought Andre became known for the Second Waltz and the Blue Danube! October 21, 2017 at 11:26 PM · I think his castle is really nice. Listen too and it bring peace to them. Beautiful! Thank you Andre! You have been blessed. October 22, 2017 at 06:14 AM · I love Andre Rieu not only because of his musical ability but also because he has the ability to involve every member of the audience watching him. That is pure showmanship long may he perform for us along with his wonderful orchestra. October 22, 2017 at 08:42 AM · Absolutely beautiful music from everyone in the JSO. Have been to the concerts in Maastricht. Always spectacular! October 22, 2017 at 07:01 PM · As "Duke" Ellington said: "If it sounds good it is good." I love most of the European instrumental music (not big a fan of most of the really early music). That being said, I like a lot of different kinds of music, particularly Jazz. As a musician I play mostly European "Classical." As a concert goer, I much prefer chamber to large orchestral. Ok, that's me. What I find interesting about Rieu is that he manages to get the 20 and 30 year old crowd out to his concerts. Here in NJ most concert attendees are grey headed with only the occasional person in their younger years (and usually a musician, student of the performer, or family member). Rieu, Disney, et al, it is entertainment and perhaps if some concert organizers weren't so stiff we might have more younger people involved. No, Rieu's programs don't require an intimate knowledge of the music, all that is required is the desire to be entertained and willingness to listen. I would wonder how many of his younger audience will be among the grey heads at sophisticated concerts decades in the future. October 23, 2017 at 09:16 AM · For a while, Liberace was the highest-earning performer in the US, perhaps in the world. Something for y'all conservatoire-wanna-be's to think about. By the way I love "violinist.mom." That made me smile. October 23, 2017 at 12:55 PM · Gahhh! It's not classical music. It's Strauss. Andre Rieu is and allways will be the James Last of the violin. October 23, 2017 at 01:59 PM · Classical with a little "c," we are all aware Johann Strauss was a Romantic-era composer. It is light music, to be sure, but well-constructed and clever. I don't think we need to throw shade on Strauss! October 23, 2017 at 04:13 PM · I wasn't aware of this artist or his orchestra. He seems to have found a good marriage of visual and music appeal. Many music forms take off when they have the wings of showmanship. Reminds me of Celtic Woman and similar shows that took popular elements of a music form and added pleasing visuals to the show.Glam rock might not be the best comparison, but I think it deserves mention as another music form that uses similar ideas. Waltzes are not deep musically as compared to more serious classical works, yet are more familiar with the general public and widely accepted. Even a serious classical listener can appreciate it. The sold out shows speak for themselves.Both have found something that appeals to a wide range of listener. If he plays 100 shows a year, I doubt he has much time to enjoy that castle. October 23, 2017 at 04:17 PM · And some would take it as a compliment, so it's all a matter of perspective! I'm not saying everyone has to like what this artist does, but I think there is much to learn here. For example, letting a show evolve. A performer has to have a certain generosity of spirit to go to the kinds of lengths that Rieu has gone to. I think we can use Rieu's example to think about what it might look like for each of us in our own art, to really get in there and try to embody we're doing, using all the imagination we can, and setting aside all the risks that it requires to turn oneself inside out for an audience. Some will hate what you do, you know that. But the ones who connect will really connect. He's created a context, an entire "world" around what he is doing, and there are people who want to live in that world. No pencil-pushing accountant is going to understand the immediate financial return of outfitting your orchestra musicians in ball gowns - that's a detail that the artist insisted upon, seemingly unrelated to his "product." And yet it's something that creates a context, and context is one of the number one things that people complain about, when it comes to classical concerts. No, we don't have to create exactly this kind of context, but we also need to do something beyond just letting it all slide into default. One of the reasons why Disney Hall has been successful was Frank Gehry's stated purpose of creating "a living room for the city." There are details about the hall that convey its purpose and aim. We need to find that, whatever it is, and bring our audience into the experience. Yes, the whole entire presentation matters; it feeds into the audience's experience. The more thought, imagination and attention we put into shaping our audience's experience to fit our artistic vision, the more success we can enjoy. October 23, 2017 at 05:56 PM · I love his music and I am very excited to be going to see and hear him in Orlando next month. October 24, 2017 at 04:03 AM · Looking at Rieu's audiences, they seem to be very happy, and in the end, this is what it's all about. Who am I to tell people that it's not "real" classical music. That's just snobbish (and the Vienna Philharmonic could tell a thing or two about performing Strauss). October 24, 2017 at 10:52 AM · I would suggest that he is an example of entrepreneurship in the arts before we created degrees and certificate programs. Consider how many people are employed in arts-related jobs as a result of his orchestra and concerts. The economic impact is pretty impressive. October 24, 2017 at 04:25 PM · I can remember "back in the day" when members of less successful rock bands would accuse members of more successful rock bands of "selling out." The less commercially successful rock bands like, say, "Lothar and the Hand People" weren't quite so willing to compromise their art for the sake of commercial success. Is there a parallel here? October 24, 2017 at 06:42 PM · Ah, the world of music. Starving artists, highly paid soloists, hard working orchestra players supplementing their incomes with teaching and some non-musical work, perhaps a spouse/partner with a great day-job with benefits. In the end I think all musicians have come to the realization that their art is actually entertainment. Entertainment means catering to the demands of the customer. I used to think that Rieu's audiences were all grey-heads until I looked closely at the audience in the PBS shows. It's about 50/50. No teens, but lots of 30-plus people. They can afford the ticket prices and they enjoy the show. Meanwhile, the audiences for the strict symphonic orchestras fade and grow older. Many are adding movie music, and other non-traditional work; yet everyone is still dressed in attire from the Victorian era and look terribly serious. Is Rieu a "Sell-out?" Nope, he is a cunning as he can be and using what talent he has to the max. FWIW: I always chuckle at the amount of rosin on the end of Rieu's fingerboard - something I'd critique my students (and myself) about and he still has that signature smile. Crying all the way to the bank. October 24, 2017 at 06:45 PM · I think the first time I heard Andre Rieu was about 14 years ago on San Francisco's classical FM station, sitting in our car with my wife, waiting for out granddaughter to get to her middle school's parking lot. The music was his version of "Song to the Moon" from Dvorak's opera, Rusalka. I was so enchanted by that music that I had not heard before that I purchased the record it was on, and nagged my local music store until the they would sell me the only version of it they had - a rather ancient copy of the soprano solo with piano accompaniment priced at $20 - that they let me have for $10, which, of course I adapted for violin solo. About 5 years later my orchestra accompanied a soprano performing the solo. I prefer the violin solo. I'm not really a Rieu fan but I applaud his showmanship, his stage personality and I have enjoyed a number of the things he has performed on TV/DVDs. Unfortunately I don't think I have ever heard him play his newer Strad. October 25, 2017 at 11:29 AM · In answer to the critics of andre rieu, he provides light hearted music, not all waltzes,and covers a lot of classical music in his enjoyable style. with some unusual guests. Long may he carry on entertaining the whole world.